We head home in a little more than two weeks! A lot must happen first, so things are even busier than usual. The docking of the Russian Progress cargo ship a few days ago was a great success. This was a crucial step toward getting the Expedition 29/30 crew (Dan, Anatoly, and Anton) off the ground in a week. Right now we are simultaneously preparing for our departure, planning for their arrival, trying to optimize our short handover period and looking at what changes might be required if they are delayed, and we must depart before they get here. Of course, we’re still running a space station and keeping the science program moving forward too! But let’s forget about all that for just a few minutes to talk about a few of my favorite photos. The first was taken as we were coming across the Atlantic and are approaching Europe. Great Britain is on the left with London shining as the brightest city. (This is a rare view with so few clouds!) Across the English Channel we see much of Western Europe rolled out like a glowing carpet. From space at night, Paris draws our attention away from the lacework pattern of smaller communities across France – much like it does on the ground. You can have a lot of fun using a map to identify the different countries as you look around. 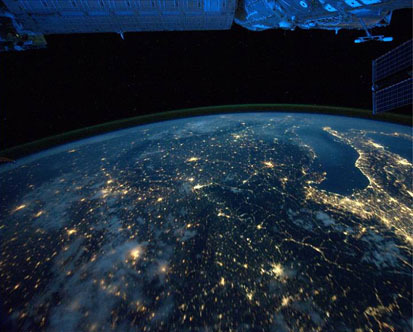 It’s always great to have some time to look out of the windows, but it’s really amazing over Europe at night due to the concentration of people living in an industrialized world with the lights burning brightly. 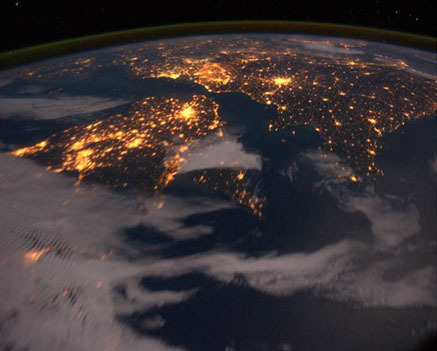 Borders which aren’t visible in the daylight sometimes show clearly at night because countries have different standards for outdoor lighting. You can even get clues to the highway systems by looking for communities clustered in a line like pearls on a string. As we travel along at 5 miles per second with a trend toward the south east, the countries go rolling below us. Here we see look down the length of Italy as it stretches into the Mediterranean Sea. I had no idea Northern Italy was so heavily populated! Although somewhat distorted from this angle, it really does look like a boot when you are overhead. I found the next view to be even more amazing. Egypt is immediately identifiable by the illumination of The Nile River and the delta where it empties into the Mediterranean. It appears like 99% of the population of Egypt lives on the Nile. 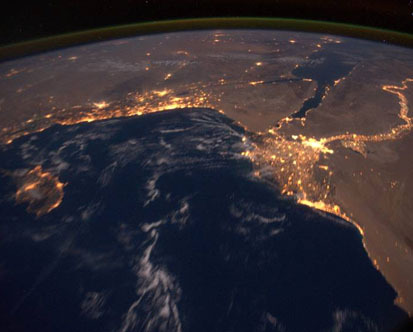 The Red Sea stretches southward toward the horizon and the Suez Canal stands out as a brightly lit line to the Med. On the left side is Israel. In the daylight you can see roads and major cities, but the other communities blend in to the dry rocky landscape which from here looks unchanged since Bible times. At night the extent of the development in this small country stands out in vivid contrast. Always fascinating! I hope you enjoy the views almost as much as do I!! I look forward to getting home soon, but I am definitely going to miss this amazing place. Mike… it was really a wonderful sight… i love your take.. and as you are moving each and every step in your life, i Pray you will achieve lot more and help us… once again thanks Mike .. LoL.. Thank you for sharing. Very fascinating to see all this! It’s like having God’s eye view of earth.